The Baltimore Sun’s Childs Walker ranks The Fantasy Baseball Guide 2006 “The Best” of the preview magazines, though I can’t believe he thinks the other magazines are better looking. Still, i’ll take it. MLB.com’s Mark Newman asked me to kick in some tips for new fantasy baseball players. 10 to be exact. I gave him 11 and he appropriated the last one, which is to have fun. Reading them over now I wonder if I missed some. Is it Bay or Abreu for you? BJ Upton, Delmon Young or Travis Lee: Why Ray are you going to catch? Will Josh Willingham? Hattie or Jamey Carroll? And Who’ll be burned by AJ Burnett? This week’s column is posted. The first column of the new year is up at mlb.com. Do the Mets have a Reyes of hope batting Jose first? Does Oliver Perez have some more control? Weekly or daily transactions? And introducing Chatter, about Esteban German, Jeremy Hermida, Jon Papelbon, and Bengie Molina. Expect a new column every Wednesday from here on out. And send your questions to Ask Rotoman. This link doesn’t lead to anything now except the fantasy page at MLB.com. Well, MLB.com is still commenting on offseason moves, helpfully, and you’ll find those at this address. But starting on Wednesday you’ll find Ask Rotoman again for the Sixth Year In A Row! As much as I like spouting off on baseball issues and giving my opinion about fantasy moves, the best stuff in the column comes from you readers. Funny questions, provocative questions, challenging questions, these don’t always make my job easier but they make the column better. So if you have a good or funny or outrageous or clever or provocative question, please send it along by writing either to peter@askrotoman.com or visit the discussion board at talk.askrotoman.com and post there. Thanks. Anthony Beaulieu won the 2nd Annual Rotoman Regulars League, and with some encouragement from me wrote a Strategies of Champions piece about how he put together his winning team. Confusion about the due date and some last-minute ads nudged the piece out of the magazine, but that doesn’t mean it isn’t worth a look. I don’t think anything teaches us more about strategy than learning what actual champions did to win their league. Actually, what got me interested in this post, was that Oddjack called me “salmon-pants Rotoman.” I own salmon pants (though my fashion consultant calls them “tomato,” and I only occasionally wear them, preferring black and slate). But how would Oddjack know that? My imagination scares me. More egregiously, Oddjack seems to suggest that I suggested last June that Players (note capital P) should give up on Victor Martinez, when the gist of my post was absolutely the opposite. If you bailed on VM last June, blame Oddjack. Not Rotoman. And check the link. I never said it. I do think Oddjack is a fine moniker. I’ve just added a picture of the front page of the magazine, which arrived in my hands yesterday, and which should be in stores on January 20th. Given the vagaries of the distribution business I’d suggest keeping an eye out about then, especially at Barnes and Noble and Wal-Mart, where we’ve usually had good distribution. This year there are Cost Scans, showing what players cost, as well as the Earning Scans, for the past five years. This profit and loss information is so important, since it isn’t just what a player earns that makes him valuable, but what he cost. 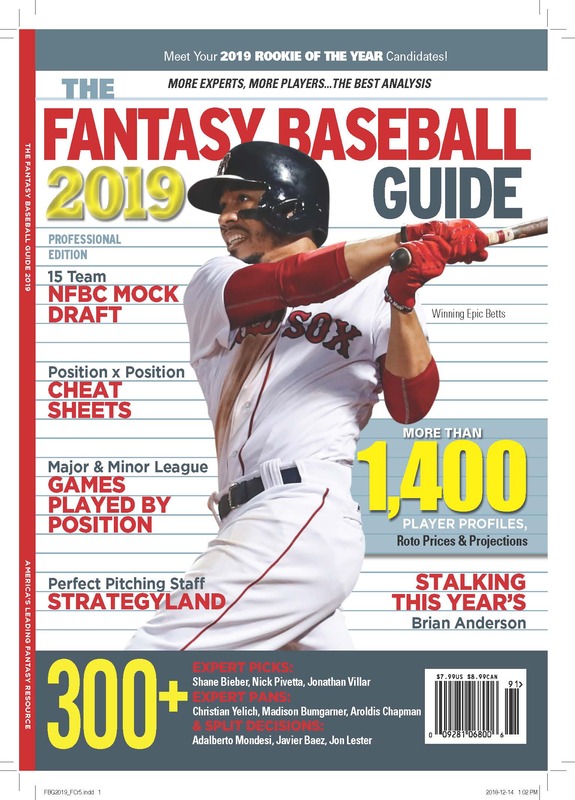 No one else covers as many players as we do, which means The Guide (which is ordered alphabetically grouped as Hitters and Pitchers) is the one fantasy magazine you’ll find useful all season long. This year magazine owners will find a web address inside which will take them to a page that includes updated price lists for 4×4, 5×5 and mixed leagues, extra value for draft prep. There’s lots more, too, including strategy articles and stats and a mock draft with a pretty good list of brand name experts (Shandler, Ambrosius, Grey, Zola, Leibowitz, Berry, Schwartz, among others). And there are more than 300 Picks and Pans from those guys and also Alex Patton and Steve Moyer and Gene McCaffrey. Save Me’s hypothesis about why closers get more saves on the road is wrong. The plain fact of the matter is that closers get more saves on the road because the home team can not get a save if they go into the ninth tied or behind or the game goes into extra innings. The visitors always have the possibility for a save no matter what the game situation. As I am sure you are aware of this, I thought maybe you could dispel this crazy notion that managers only put closers into save situations on the road. Overanalyzed hogwash was indeed Save Me’s theory. Thanks. It didn’t actually occur to me that Save Me was saying that closers got more saves on the road for any reason other than the obvious one. If you have a lead as the visiting team in the ninth inning, you have a save situation. I think Save Me was implying that managers are more likely to use their closer in a tie game in the ninth when they’re at home, because from that point on there will be no save situation for a winning home team. But whatever. If anyone was unclear on this they shouldn’t be. Closers get more saves on the road for structural reasons, not because of any changeable usage issues. And while I’m at it about yesterday’s mlb.com column, it had one of those gotcha’s. I expressed my full confidence in the column that Keith Foulke would get it together, and he was then summarily dismissed from his job as closer. Everyone is saying he’s going to get the job back, he just needs to get back on track. If you own him, don’t dump him. If you covet him, I don’t think his price could get much cheaper.